Tens of thousands of supporters attend what is likely to be Aung San Suu Kyi’s last public rally ahead of Burma’s high-stakes general election. THINGANGYUN TOWNSHIP, Rangoon — Tens of thousands of supporters turned out to see Aung San Suu Kyi on Sunday in Rangoon for what is likely to be her last public rally ahead of a high-stakes Nov. 8 election, with the opposition leader rejecting recent remarks from Thein Sein framing the incumbent president as the architect of Burma’s political reforms. The patron of Suu Kyi’s National League for Democracy (NLD), Tin Oo, laid the foundation for the critique in a speech introducing the party chairwoman. “He [Thein Sein] said the country has changed. But I wonder what he would say about the 25 percent of military appointees in Parliament. I want to ask him, ‘Is it something he has changed?” Tin Oo told rally attendees, referring to the Burma Army’s constitutionally guaranteed allotment of a quarter of seats in Parliament. The rally site, at a sporting grounds in the shadow of Thingangyun Township’s Thuwanna Myo Oo Zedi, a pagoda in the commercial capital, began filling with NLD enthusiasts several hours ahead of the popular party leader’s arrival and traffic in the area became increasingly snarled as the afternoon progressed. A sea of red—the color long-associated with the party—greeted the Nobel laureate when she took the stage at just after 4 pm to a sustained wave of applause. Speaking to the gathered masses, the NLD chairwoman said those who had come out to show their support on Sunday were a reflection of the country at large, making the claim that her party’s support base crossed socioeconomic and ethnic divides. She implored the crowd to be mindful of the election’s importance. A combative Suu Kyi also asserted that those who said the country had already changed enough, presumably a reference to Thein Sein himself, were the ones who did not genuinely want to see substantive reform. “We all have recognized that Burma needs changes,” she said. “So you may have noticed that those who said the country has changed and no more change is needed are the ones who don’t really want to change,” she said, making her case for why the party needs a landslide victory on Nov. 8. “To carry out the change you want, we need to be a majority in the Parliament. That’s why we are asking you to vote for the NLD,” she added. A supporter greets Aung San Suu Kyi ahead of her speech to a crowd of tens of thousands in Rangoon's Thingangyun Township on Sunday. At a national level, the Nov. 8 contest is expected to largely be a battle between the NLD and Thein Sein’s ruling Union Solidarity and Development Party (USDP). Pointing to her party’s nearly 30-year history, Suu Kyi said the NLD had earned the public’s trust and was not afraid of the result that this month’s vote would return. “I have always said, ‘We want to win.’ We want to win a landslide, 100 percent [of the vote]. 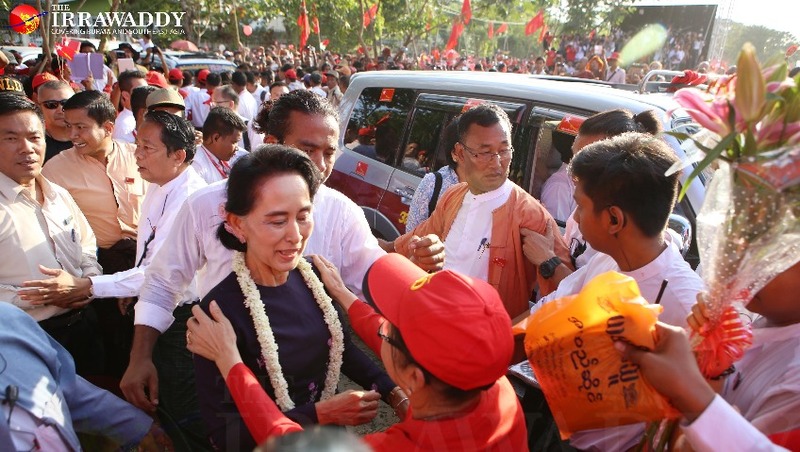 We want to win with the verdict and involvement of all people,” she said, noting that even in the event of a clean sweep for the NLD, the party would still only hold at most a 75 percent majority. Suu Kyi went on to reiterate a call for individuals to exercise restraint during the dwindling campaign period, on election day and beyond. For Tin Tin Hmwe, a housewife from Rangoon’s Dawbon Township who came to the rally with her family, Suu Kyi’s pledge to bring “change” has resonated. “Amay [mother] Suu said it’s time to change. Some say changes have already been made and [they ask], ‘Is change still needed?’ Their change is not real change. Their change is just for themselves,” she said, adding that she intended to vote for the NLD next Sunday. Than Htay, 62, left Kyimyindaing Township at 11 am to attend Sunday’s rally, a journey involving three different buses. He told The Irrawaddy that he had voted for the NLD in Burma’s 2012 by-election, and would do the same this year. During a question and answer session following her speech, one NLD supporter asked Suu Kyi for her thoughts on recent remarks from Burma Army commander-in-chief Snr-Gen Min Aung Hlaing, who said on Oct. 20 that military personnel and their families should vote for candidates who are free from foreign influence. “It’s something that should not be done. The Constitution states that all citizens have freedom to vote as they like. I dare say that no one has the right to put pressure on someone else regarding who they should vote,” she answered. Kyaw Thet Khaing, a wholesale distributor of print media publications, said he hoped that if Suu Kyi’s party wins, the international community would offer Burma more support, given her standing abroad. “I trust her as she is a woman and so strong mentally,” he said. “She has given up her life for the public. She could have lived without giving anything to the public, but she sacrificed her life being under house arrest. Top Photo - (Myo Min Soe / The Irrawaddy ) Tens of thousands of supporters listen to a speech from National League for Democracy chairwoman Aung San Suu Kyi in Rangoon’s Thingangyun Township on Sunday.